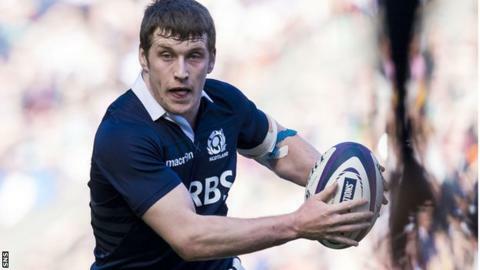 Glasgow Warriors and Scotland centre Mark Bennett faces a race to be fit for the 2015 World Cup after undergoing shoulder surgery. The 22-year-old sustained an injury during Scotland's disappointing Six Nations tournament and is out of action for the rest of this campaign. Warriors' winger DTH van der Merwe has also had an operation on a hand injury suffered against Cardiff Blues. The Canada international might return before the end of the season. But if not, the South Africa-born player will have made his last appearance for Glasgow ahead of a summer move to Welsh side Scarlets. Alex Dunbar and Matt Scott are other Scotland centres struggling to be be fit for the World Cup in England in September.